Topics: Asca Staff, The Richmond Centre, Elligibility, Procedure, and Charges. Its 4 DNS Records include, dns155.c.register.com, dns201.a.register.com, and dns177.d.register.com. 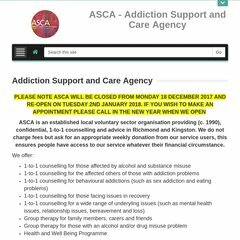 Addictionsupport.co.uk's server IP number is 209.235.144.9.